Anna Bolton | Greene County News Dominion Voting Systems Sales Manager Mark Beckstrand shows the ImageCast X to Greene County Board of Elections officials and Board of Commissioners March 6. 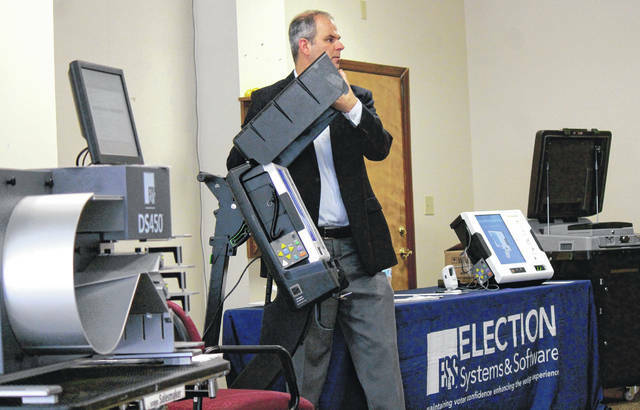 Regional Sales Manager Craig Seibert from Election Systems & Software (ES&S) demonstrates using various voting machines — DS450, ExpressVote and DS200. Dominion’s ImageCast X, which can be paired with a Voter Verifiable Paper Audit Trail (VVPAT) printer, has a 21-inch touchscreen. Board of Elections Director Llyn McCoy speaks during the meeting as Board of Commissioners Risk Management Director Lisa Hale, Board of Elections Deputy Director Denise Percival and Board of Commissioners Clerk Lisa Mock listen. XENIA — Greene County Board of Elections (BOE) voted March 25 to select a touchscreen Direct-Recording Electronic (DRE) voting machine from Dominion Voting Systems. BOE is expected to submit a contract to the Board of Greene County Commissioners (BOCC) for approval. According to the boards, the state is providing around $1.7 million for the machines. The county is to pick up the additional cost. County Administrator Brandon Huddleson has said that the BOCC has been forward-thinking regarding their budget by putting away a sum of money over the past few years to use for voting machines if necessary. If the selected machine — called the ImageCast X — is approved, the out-of-pocket cost for the county is currently $475,479. Dominion’s most recent quote allows a $818,202 trade-in allowance for the county’s old machines. Currently, Greene County uses a different DRE device by Dominion. DREs allow a direct vote on the machine by touchscreen or buttons and processes data with a computer program. Dominion Sales Manager Mark Beckstrand presented products to the boards during a special meeting March 6, including the ImageCast X, which he described as closest to the county’s current machines. With a 21-inch touchscreen, the ImageCast X resembles a very large iPad. Voters have the ability to increase text size or change font color from black on white to white on black. The device can sit on a table with a privacy screen. In case of a power outage, externally-charged batteries are available. “There’s no ambiguity. You touch, you mark. You can select, you can de-select. A vote is a vote and it’s not going to change,” Beckstrand said. With the ImageCast X, the voter inserts a voter card, selects the candidates or issues, and uses a keyboard to type in write-in candidates. The device then pulls up a review, in which the voter decides to print and cast the ballot. The device also doesn’t require calibration. Votes are stored on the device via memory sticks, which are removed at the end of the night. A Voter Verifiable Paper Audit Trail (VVPAT) printer is also to be purchased with the device. The printer has a scanner inside of it to create a permanent paper record. Voters are then able to review the paper record before casting it. This also can be used as record for counts, audits and recounts. Dominion’s devices are also ADA compliant, which means there is no need to purchase a separate device for each polling location. The ImageCast X also has audio-playback functionality for voters with disabilities. Beckstrand also presented an optical scan tabulator, ImageCast Precinct, to the boards. Using this machine, a voter marks his or her paper ballot and inserts the ballot into the scanner to be read. Once the system determines that no ambiguous marks or overvotes were made, it deposits it into the machine. The ImageCast Evolution, a hybrid of the two, is both a ballot selecting device and an optical scan tabulator. Gene Seets, vice president of sales for Election Systems & Software (ES&S), and Craig Seibert, regional sales manager, also pitched their own machines. On an ES&S DS200, an optical scan tabulator, voters fill in a paper ballot and then insert it in the scanner. The touchscreen ExpressVote, which Seibert touted as ADA accessible, produces a paper-based record for tabulation. The two additionally proposed a high-speed central scanner and tabulator, the DS450, which processes 72 ballots per minute. “No matter what system you choose, there is no system that is going to have no out of county cost because there’s certain costs involved that they cannot pay for with this kind of (state) money — training and those kinds of things,” McCoy said. Against advice of the BOCC, BOE officials decided not to include another certified vendor, Clear Ballot, in the demonstration phase of the selection process. Huddleson said he is awaiting information from the BOE related to the actual life-cycle cost of the selected equipment. Throughout the selection process, the intent of the boards has been to have new equipment in place for the November election. 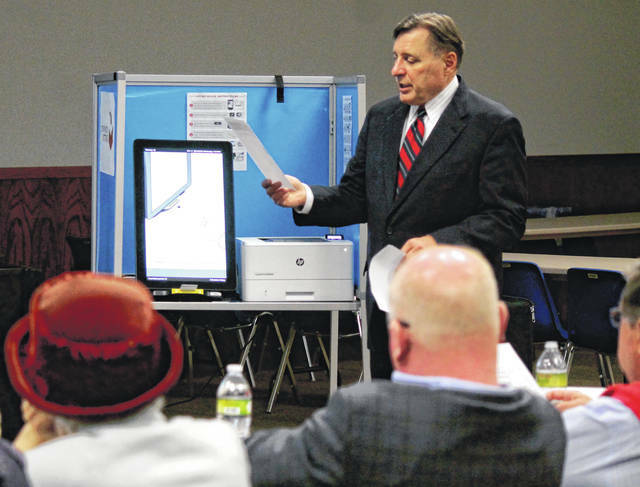 https://www.fairborndailyherald.com/wp-content/uploads/sites/50/2019/04/web1_Beckstrand.jpgAnna Bolton | Greene County News Dominion Voting Systems Sales Manager Mark Beckstrand shows the ImageCast X to Greene County Board of Elections officials and Board of Commissioners March 6.
https://www.fairborndailyherald.com/wp-content/uploads/sites/50/2019/04/web1_ESS.jpgRegional Sales Manager Craig Seibert from Election Systems & Software (ES&S) demonstrates using various voting machines — DS450, ExpressVote and DS200. 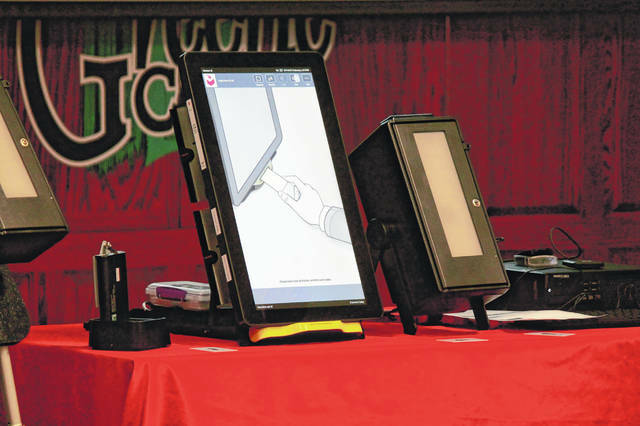 https://www.fairborndailyherald.com/wp-content/uploads/sites/50/2019/04/web1_ImageCastX.jpgDominion’s ImageCast X, which can be paired with a Voter Verifiable Paper Audit Trail (VVPAT) printer, has a 21-inch touchscreen. 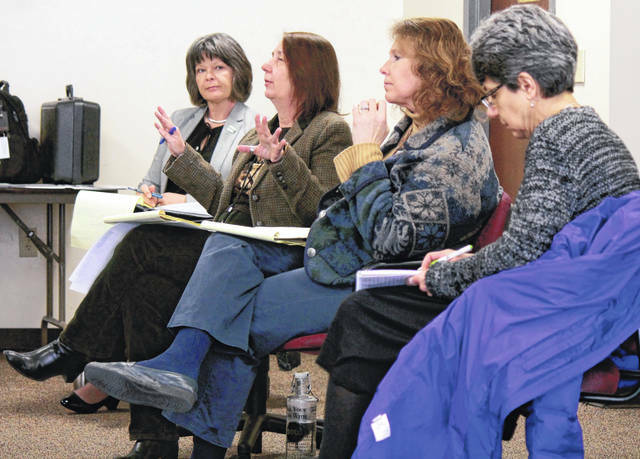 https://www.fairborndailyherald.com/wp-content/uploads/sites/50/2019/04/web1_McCoy.jpgBoard of Elections Director Llyn McCoy speaks during the meeting as Board of Commissioners Risk Management Director Lisa Hale, Board of Elections Deputy Director Denise Percival and Board of Commissioners Clerk Lisa Mock listen.